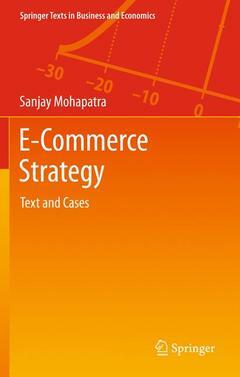 E-Commerce Strategy: Text and Cases provides the fundamental literature required for graduate students and practitioners to understand electronic commerce. Each chapter provides clearly designed learning objectives and review questions to highlight the major topics and goals. This book covers many of the new innovations and technologies that have been established for e-commerce site development. Unlike similar books, topics such as e-channel adoption, factors affecting e-commerce adoption, and strategy design are reviewed in greater depth. Additionally, the book examines areas not normally covered like open source, online research, and peer-to-peer systems. Understanding E-commerce.- Technology of E-commerce.- Web Page Hosting.- Concepts in E-commerce.- Understanding E-commerce Product Design Strategy.- E-commerce and Online Auctions.- E-commerce Strategy.- Channels in E-commerce.- E-commerce Portal Design Strategy.- Future Trend -Â Social Commerce.- Drivers of Online-selling Diffusion: A Look at Organizational and Environmental Factors Through Time. Sanjay Mohapatra received his B.E. from NIT Rourkela, M.Tech from IIT Madras, PGDBM XIMB, India and has finished his Ph.D. from Utkal University, India under management department. At present, he is an associate professor in Information Systems in XIMB, India. Professor Mohapatra has more than 21 years of industry experience. He has worked in various capacities in organizations like Hindusthan Aeronautics Limited, Larsen & Toubro, PricewaterHouse, Infosys, Polaris & J&B Software. His teaching interests are in IT Strategy and Management Information Systems and research interests are in the area of IT enabled processes. He has authored/co-authored ten books, more than twenty papers in peer reviewed international journals.